The steps below outline how to connect to a live session using Mozilla Firefox. A camera and microphone are not required, but they are recommended for the best experience. 2. Notice the pop-up message in the upper left corner of the browser window. Select the appropriate camera and/or microphone from the drop-down lists (if necessary). Note: If you close this pop-up or click elsewhere on the screen before sharing access to your camera and/or microphone, you can open it again by clicking the camera/microphone icon on the Firefox task bar to the left of the URL. 3. Click the drop-down arrow next to "Select Shared Devices" and then select Always Share from the drop-down menu. 4. The session should now connect. If you are properly connected, you should see the text on the red screen change to “Connected! Your coach has not yet arrived. Please wait…” or you will see your coach on the screen. You will also see a small box with a Firefox logo at the top of your screen. If you've purposely blocked the site from accessing the camera and/or microphone or you do not have a camera and/or microphone, you can still connect to the session without using these devices. While it is not required to have a camera and/or microphone, it is recommended for the best experience. 1. Click the JOIN button in the upper right corner of the member dashboard. 2. After joining the session, you will see a prompt in the middle of the page stating that there is a problem with your camera. 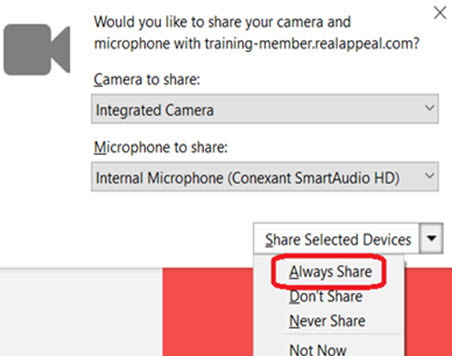 If you have a camera installed and would like to use it, click Retry with Camera to access the option to share your selected devices as seen above. If you do not have a camera, or prefer not to allow the site to access it, click Continue without Camera to proceed. 3. After you have continued without the use of your camera, you will see another similar prompt, stating that there is a problem with your microphone. 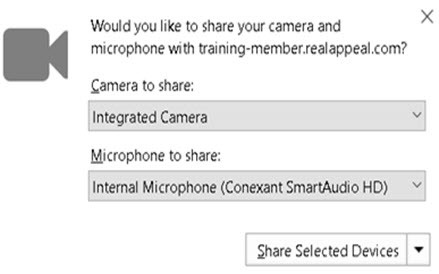 If you have a microphone installed and would like to use it, click Retry with Microphone to access the option to share your selected devices as seen above. If you do not have a microphone, or prefer not to allow the site to access it, select Continue without Microphone to proceed. 4. The session should now connect. If you are properly connected, you should see the text on the red screen change to “Connected! Your coach has not yet arrived. Please wait…” or you will see your coach on the screen. The small box with a Firefox logo at the top of your screen will no longer be displayed if you chose to not use a camera and/or microphone.